Welcome to the Comfort Hotel Göteborg at Skeppsbroplatsen in central Gothenburg. This is a great location right next to the Göta River and just ten minutes from Avenyn. Skeppsbrohuset - one of the most famous buildings in Gothenburg - has undergone an extensive makeover in the last few years. With 289 spacious hotel rooms, a breakfast room and lounge, a gym and sauna, and our OGBG Bar & Restaurant that boasts a fabulous menu with flavours of Asia, we bring something truly unique to the Gothenburg hotel scene. The Comfort Hotel Göteborg enjoys some of the best views of Göta Älv (Göta River) and it is the perfect base from which to explore Gothenburg as it is located right in the heart of the city, just a 10-minute walk from Gothenburg Central Station, excellent shopping and bustling nightlife. The Comfort Hotel Göteborg is a cash-free hotel. This provides a safer working environment for our staff as it reduces the risk of theft and burglary. It also means that we have more time to spend on taking care of our guests. More information about this can be found under FAQs. Do you appreciate rich flavours, fresh ingredients and delicious drinks? 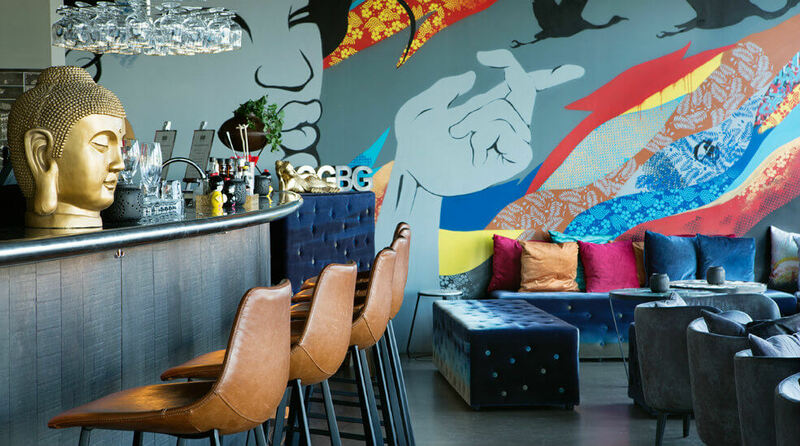 The OGBG Bar & Restaurant celebrates the flavours of Asia offering tasty, healthy dishes inspired by East Asian street food. Guests can look forward to freshly prepared food, served quickly and simply in a relaxed and welcoming setting. We aspire to be the smartest and trendiest hotel in Gothenburg, and we want to excite our guests with stunning design features. In addition to nice rooms, we also have conference facilities, a lovely courtyard and TaKeT - a fabulous roof terrace that is open all year round when the weather (or wind!) permits. You can even plan birthday celebrations or work parties here at the hotel. Whatever your reason, we hope to see you at the hotel some time soon! When you stay at the Comfort Hotel Göteborg, we offer free WiFi and a delicious breakfast buffet. On Sundays, you can have a nice lie-in as breakfast is served until 12 noon and you won't need to check out until 6pm! Please note that this is subject to availability, so please make sure to check this with us in the reception and we'll do our best to accommodate your request for a late check-out! The lounge is a great place to check your emails or socialise with friends as you listen to great music. And you certainly do not want to miss the the culinary delights of the OGBG Bar & Restaurant. If you're looking for something to do, we're happy to provide recommendations. There are lots of attractions nearby including Maritiman, Göteborg Opera and Strömma. For more information or for help in booking tickets, please contact the reception. View our services here! You can find our more about the hotel, parking, accessible rooms and other useful information here. Get tips on what to do in Gothenburg here. Take a bus or tram to the Stenpiren stop right outside the hotel. Walk 800 metres to the hotel or take a bus/tram from the central station to the Stenpiren bus stop. Shuttle to Gothenburg Central Station. Change to bus 60, Express Red (Röd), Express Blue (Blå) or tram 9 or 1 to Stenpiren bus stop. The journey takes about 30 minutes by bus and 20-25 minutes by taxi. We recommend Taxi Göteborg, telephone +46 31-65 00 00.